Narrative: The Bridgewater Garden Club was formed in Bridgewater on 16 March 1949 and the first regular meeting was held on April 4 of that year with 28 members in attendance. In 1950 the Club planted its first garden. Garden planting and maintenance took place at various locations throughout the Town and continues to this day. The first flower show was held in 1952 and remains an annual event. A plant sale was first held in 1956 and the first of the garden tours was held in 1994. The club is involved in various activities such as providing info sessions by garden experts, holding fundraising plant sales, providing field trips and tours, flower arrangement and photo challenges at monthly meetings. The motto of the club is "planting today...for a greener tomorrow". 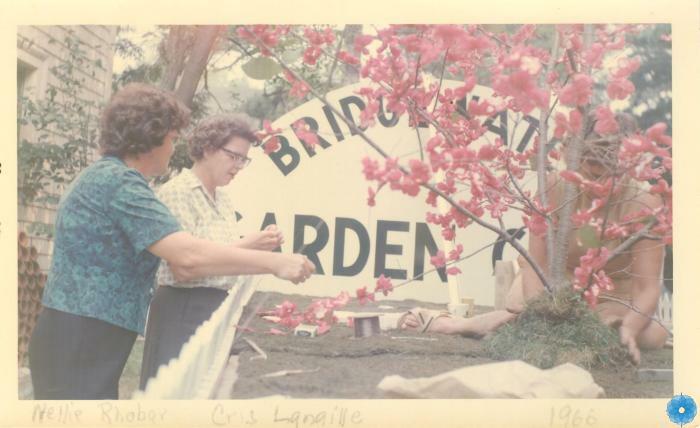 Description: Small colour photograph of three women, two on the left are Nellie Robar and Chris Langille, decorating the Bridgewater Garden Club float for the South Shore Exhibition parade. There are pink blossoms on a tire and a small picket fence. Arched sign for club in background is partially visible behind the branches. History of Use: Taken to document float.